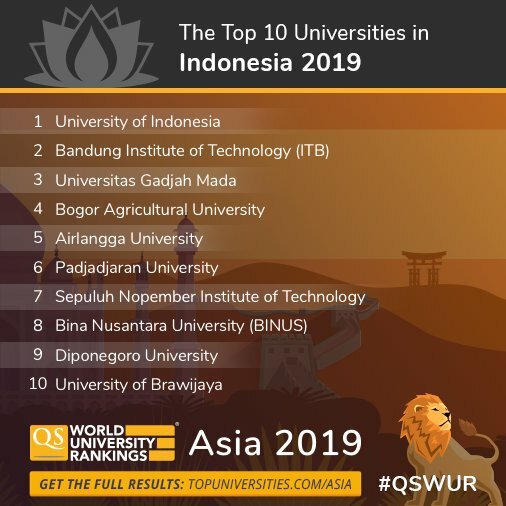 BINUS UNIVERSITY was recently ranked 8th place in Indonesia and awarded a 4-star rating by Quacquarelli Symonds (QS), one of the most popular World University Ranking publishers. QS Stars awards universities with a rating of one to five stars, depending on their performance in each of the following eight criteria: core criteria (Research, Teaching, Employability, and Internationalization), learning environment (Facilities), advanced criteria (Social responsibility, and Inclusiveness), and specialist criteria. BINUS UNIVERSITY has been awarded 4 stars, with 5 stars in Teaching, Employability, Facilities, Social responsibility and Inclusiveness. 100% of the available points were achieved for employability, as the institution has an excellent reputation amongst domestic employers in addition to its high graduate employment rate of 97%. This has been attributed to the career service support provided to the students coupled with the large number of partnerships the university actively pursues in academia as well as industry. Furthermore, the university’s facilities reached full points for student accommodation, IT infrastructure, sports facilities, medical facilities and student societies. The major improvement has been through Internationalization which reached 4 Stars with full points on three indicators: Inbound Exchange Students, Outbound Exchange Students, and Religious Facilities. BINUS UNIVERSITY has more than 39 nationalities represented on its campus. With a significant increase in research collaboration with international partners, the university’s ranking for research has also improved. BINUS UNIVERSITY achieved 2 stars for its first study program assessed by QS Star. Its undergraduate degree in Computer Engineering has been nationally and internationally recognized, and accredited by ABET since 2015. The university has as well climbed one place in the national ranking since last year on QS University Rankings: Asia 2019. BINUS has been in the top 10 of the best Indonesian universities for several years now, currently holding 8th place. As such, the university ranks in the top 2% of Asian universities, with the current rank #251-260. This latest achievement highlights BINUS UNIVERSITY’s continuous efforts to provide its students with an education system that supports creative minds, eager to lead major academic and industry breakthroughs.